ATLANTA, GEORGIA, USA, November 27, 2017 /EINPresswire.com/ -- Hosted by ABC WSB-TV reporter, Tom Jones, and WRFG Radio, DJ UK Bob, Legendary bluesman Bobby Rush lends his voice to the cause to help save lives: “Prostate cancer is a deadly disease that is impacting too many men, particularly African American men because we are not talking about it. Together we can change that and save lives” Bobby Rush. The 2017 Blues 4 Prostate Cancer Education Tour is making an impact in the Atlanta metro area on December 16 with the Royal Blues Holiday Celebration for Prostate Cancer Awareness. 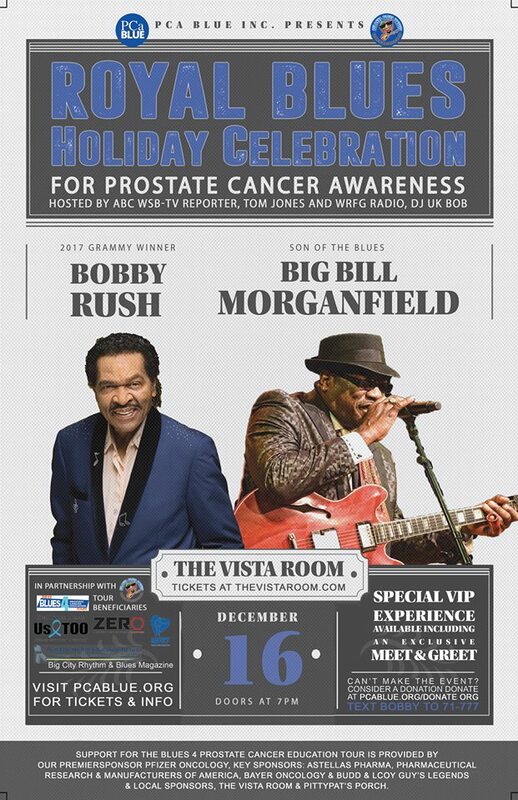 PCa Blue and the Atlanta Blues Society are working together to connect the dots between prostate cancer and blues music by hosting an educational concert event on Saturday, December 16 at The Vista Room. The show will feature legendary bluesman, GRAMMY® Award Winner Bobby Rush and Atlanta’s very own Blues Master Big Bill Morganfield, (Muddy Waters’ son). The event is a fundraiser for PCa BLUE, a 501(c)(3) nonprofit organization dedicated to raising prostate cancer awareness. Proceeds from events support national prostate cancer education organizations, PHEN, Us Too and ZERO, and the Blues Foundation’s HART Fund (Handy Artists Relief Trust), which helps blues musicians and their families in financial need due to a broad range of health concerns. Prostate cancer is the most commonly diagnosed cancer in American men. There are nearly 3 million prostate cancer survivors in the U.S. today and more than 161,000 men will be diagnosed this year. All men are at risk, some more than others. This is a cancer that has very few if any, noticeable symptoms when it is in its earliest, curable stage. Learn more at www.pcablue.org/prostate-cancer-information. Each educational event of the tour promises a great evening of blues music plus prostate cancer information from medical experts, survivors and advocates about the risk factors, screening procedures and treatment options available. Prostate cancer survivors will share their stories and leaders from the urology and oncology communities will share their knowledge. This event will include a silent auction. A special VIP Experience including a private meet and greet at Pittypat’s porch the evening before will be available to a limited number of guests. The event is hosted in partnership with the Atlanta Blues Society (ABS), an affiliate organization of the Blues Foundation. 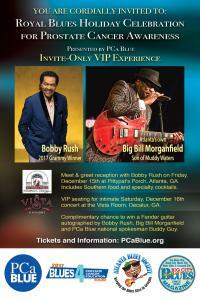 “Partnering with the Atlanta Blues Society is a wonderful opportunity and honor for PCa Blue. We have come together to connect the dots between prostate cancer and the blues, directly impacting the Atlanta area with lifesaving information and valuable resources” Ivy Ahmed, CEO, PCa Blue. Buddy Guy is the national spokesman for PCa Blue and together with Bobby Rush, they are using their voices to bring prostate cancer awareness and information to the public. Both men are dedicated to the cause after losing family members to the disease and will be performing together on at the PCa Blue sponsored event on January 4, 2018 kicking off Buddy Guy’s January residency at Buddy Guy’s Legends. The first concert of the 2017 Blues 4 Prostate Cancer Education Tour was held in Memphis in the spring and featured Buddy Guy, Bobby Rush, Vasti Jackson, the Bo-Keys and Southern Avenue. Two events were held in the Chicago area during September, prostate cancer awareness month. Support for the Blues 4 Prostate Cancer Education Tour is provided by our Premier Sponsor Pfizer Oncology, as well as Key Level Sponsors: Astellas Pharma, Pharmaceutical Research and Manufacturers of America (PhRMA), Bayer Oncology and Buddy Guy’s Legends. Local sponsors include Pittypat’s Porch, the Vista Room and Big City Rhythm and Blues. PCa Blue, a 501(c)(3) national nonprofit organization dedicated to increasing awareness about prostate cancer. We leverage blues music and healthcare professionals to educate men and their loved ones so they recognize their personal risk, seek appropriate testing and, if diagnosed, understand the numerous treatment options available for them. For donations visit www.pcablue.org/donate.